Developing an interactive resource library and professional community for educators | Clarity Innovations, Inc.
A personalized professional learning system for improving educators’ effectiveness through training, coaching, and mentoring. The Northwest Colorado BOCES came up with a unique approach to improving educator effectiveness and proposed it to the U.S. Department of Education. Impressed with the proposal, the federal government awarded the Northwest Colorado BOCES a $2.9 million Investing in Innovation Grant (i3) to implement it. After winning their i3 Grant, Northwest Colorado BOCES was faced with the daunting task of turning their vision into a reality with a relatively modest budget and ambitious timetable. In particular, Northwest Colorado BOCES was unsure as to how to effectively engage teachers, and how to integrate their activity on a website with the custom performance management system they were developing concurrently. Based on Clarity’s experience in successfully creating professional learning communities, we were hired to architect, design, and build the System for Educator Development—Personalized Accessible Knowledge (SEED PAK). We worked with the client to translate rough sketches of general functionality and high-level objectives from the grant proposal into clear requirements and feature specifications. We then designed and built an extensive Drupal-based website tailored to meet the needs of educators. This included developing the ability to track participant's responses to prompts within each resource. 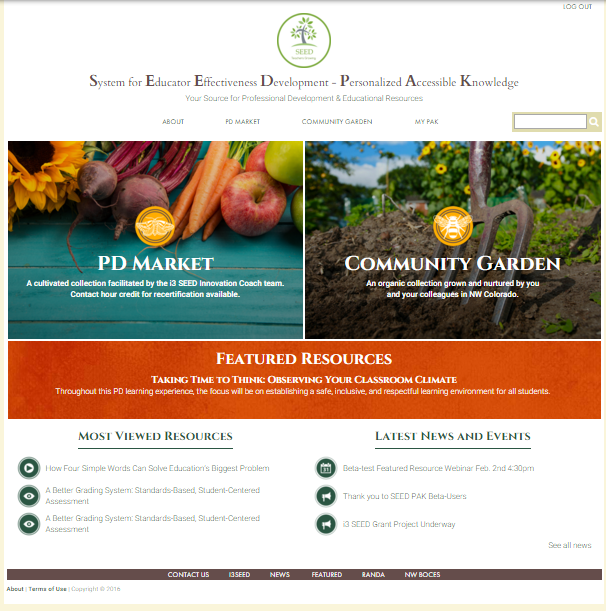 The SEED PAK website also featured full integration with a third party performance management system, sharing data about available resources and participant completion data, used by Northwest Colorado BOCES for recertification credits. In April 2016, the first phase of the SEED PAK website was launched and is now in use by over 700 teachers in rural northwest Colorado.